Yes! I'm ready to have less stress, experience more happiness and inner contentment, and increase awareness and focus! 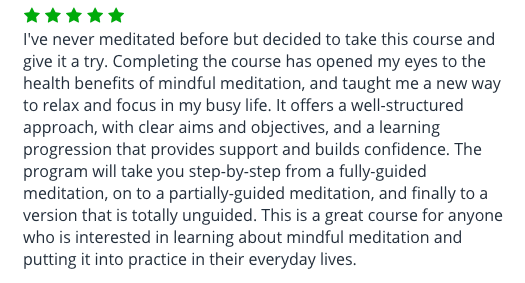 I also understand that when I act now, I get instant access to "A beginner's guide to mindfulness meditation"
PS - Every minute you wait to get "A Beginner's Guide To Mindfulness Meditation" is another minute you're not using this breakthrough online course to quickly and easily experience mindfulness meditation and living life in the moment. If "A Beginner's Guide To Mindfulness Meditation" doesn't take me by the hand and show me exactly how to start mindfulness meditation in the next 30 days then I understand that I will receive a full refund, No Questions Asked!